On this past Thursday, I had the pleasure and privilege of moderating an online panel discussion with three college professors who have flipped their classrooms. This discussion was arranged by McGraw-Hill and featured Dr. Danae Quirk-Dorr of Minnesota State University, Jeff Anderson from Ohio University and William Hoover of Bunker Hill Community College. We had a great conversation in Google Hangouts which was streamed to 1,600+ participants who registered to watch the dialogue. Viewers submitted dozens of great questions, which we had time to review and respond to after we discussed how these professors are using the flip. Below are the questions we used to drive the discussion, and selected excerpts from the responses that these experienced flipped classroom teachers provided. These excerpts are intended to give a good overview ‘the flip’ and related best practices, and to whet your appetite to learn more! You can watch the complete discussion in the video below. If you are new to the flipped classroom, Bill Hoover’s response to our first question will shed some light on it. In a nutshell, flipping the classroom is the idea of having students consume learning content (i.e. ‘the lecture’) outside of the classroom, usually as homework, thereby freeing up valuable face-to-face classroom time to work on assigned work (work that would have been homework in the traditional classroom), and to reinforce learning and take a deeper dive into the material. Jeff Anderson of Ohio University says that, “the flipped classroom creates more student engagement”. He goes on to explain that the lecture approach in the traditional classroom is a very passive learning environment, but when lectures are moved online, class time can be used for problems solving activities, collaboration, and group discussion. “I see a lot more engagement from my students, as they’re writing more, [and] talking more about the subjects that we’re covering”. Another benefit is deeper learning. When you move first exposure to content online and outside of the class, “you free up a lot of time to approach the subject matter in more detail and more depth”. What issues exist in the traditional classroom that the flipped classroom effectively addresses? Dr. Danae Quirk-Dorr observes that the traditional classroom is generally not tailored to the individual learner – everyone must absorb the lecture material at basically the same pace. Conversely, in the flipped classroom, students have the ability to take more control of lecture content and manage the pace – pause to take notes, or rewind and clarify when they need to. This in turn frees up class time, where you can now promote higher order thinking and increase collaboration and student engagement. What do instructors need to know to get started with flipping their classes? What best practices would you recommend to another instructor just getting started? Bunker Hill’s Bill Hoover advises teachers to be sure to be comfortable with the digital tools they are using to deliver flipped content, so they can quickly address any questions and limit the time spent on technology, keeping the focus on the learning material itself. Similarly, don’t overdo it with the technology – stick with those tools your are comfortable with. He also recommends creating some sort of ‘quick start’ guide to those tools. Another key recommendation Hoover offers is to assign points to the work students are to do outside of the classroom. This can help to ensure that the students do what they are expected to do (much like traditional graded homework assignments). Working to make sure the out of class activities are engaging also goes a long way towards helping to make sure they will be completed. How does technology enable the flipped classroom model? What technologies do you use? These three instructors each use Lecture Capture and/or Screencasting tools, such as Tegrity (for lecture capture) and Camtasia (for screencasting) to produce their lecture materials. Jeff Anderson explains how he uses also McGraw-Hill Connect and LearnSmart to provide online activities to be completed right after consuming the content, to help reinforce what they’ve read about or viewed. This also helps to ensure that students come into class the next day with the baseline materials understood. How do your students respond to this new model? Have you seen improved results in their engagement and/or performance? “Students are excited about this model because they recognize that it caters to how they learn”, cites Dr. Quirk-Dorr. She notes that they are really able to manage their own content consumption, so if they ‘zone out’ for a moment for example, it’s easy to go back and replay what they missed. They come into class excited and prepared to participate in class activities that build on the previous night’s learning. An exciting outcome that she has experienced is a significant increase in standardized exam scores. You can learn more about the growing body of empirical evidence attesting to the effectiveness of the flip in these two articles, “Gathering Evidence that Flipping the Classroom can Enhance Learning Outcomes“ and, “Measured Results Demonstrate Enhanced Learning Outcomes in the Flipped Classroom”. How does this model make you more effective as an instructor? Professor Hoover explains that this technique has helped particularly with ESL students as well as dyslexic students and students with other disabilities, enabling them to cover the basics before coming to class. If they struggle with some of the content, they have the time and opportunity to seek assistance and make sure they are comfortable with the material before class. What made you decide to flip your course? What were your goals for your students in doing so? Anderson says he was driven to try the flip out partly based on the knowledge that many of today’s traditional aged college students are ‘digital natives’ and regularly consume content online. Even adult learners are increasingly comfortable with digital content, so this approach seemed to be something that would come naturally to the students (with an appropriate level of introduction and explanation, of course). Quick-Dorr adds that she likes to bring scientific method to her teaching, and pay close attention to the data. She had found that students with particular learning styles consistently scored lower of tests, and she hoped to alleviate that by turning to flipped instruction. It has been her experience that this is precisely what happened – in the flipped classroom, students of all learning styles can excel, and the correlation between different learning styles and grades disappeared. That' a powerful finding! How do you use your class time now? How do you get students to consume the content outside of class? Dr. Quick-Dorr provides a ‘road map’ to students, in the form of an email prior to each assignment, so that they know precisely what is expected of them in order to be prepared for class. In class, she uses Clickers and has students vote for which concepts require review, and to provide answers to questions to make sure they understand what they review. By having to vote on which topics they need help with, they have to self-evaluate, which facilitates taking responsibility for their own learning. The video contains a good deal more about using class time, and techniques to help ensure that students consume assigned content. Thanks to April Boland at McGraw-Hill for coordinating this streamed Google Hangout – it was a lot of fun and a great learning experience! Be sure to watch the video for insights into a few more questions we discussed, like how to prepare students for participating in the flipped classroom, and for the informative feedback that these top-notch professors provided to the excellent questions posed by viewers. 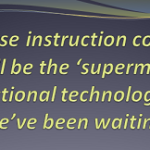 Is Reverse Instruction Education Technology's Perfect Storm? Thought that you might find this interesting on flipped classrooms.